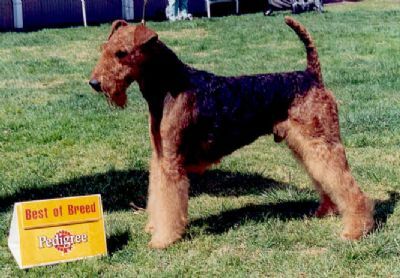 This great sound moving dynamo called Hughie has enhanced our kennel (and a number of other kennels around Australia) with his temperament, balance and distinct Airedale type. His last six all breeds shows (except Royals) has seen him win two BIS and five BIG. His Penn Hip score from the USA suits him to breeding and top kennels in Vic, NSW, and SA have used him with great satisfaction. His pups have gone to most states.While only selectively shown, his daughters are winning at breed,group and show. We very proudly announce Hughie's best of breed win at the 2002 Royal Melbourne Show. His mother was best of winners at Montgomery 1996 and has produced five American Champions (four siblings of Hughie) His father has an outstanding record as sire of Champions and some of the world's most outstanding champions. EG. 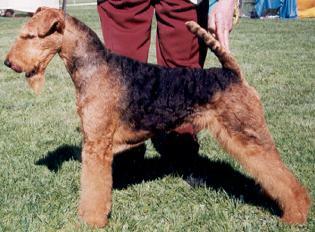 Am.Ch.Tartans Scottshire Ultraglide who won best in show at Montgomery County All Terrier Show 2002. Show retired but still at popular stud.